When looking at paintings in an art gallery, a viewer’s focus is often on the painting itself. 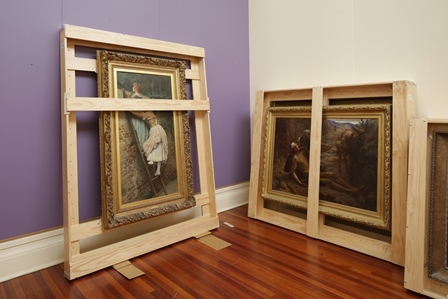 But when you’re tasked with relocating those paintings, in a project like the Sarjeant Gallery is currently undertaking, the frame can take on just as much importance. The Sarjeant has approximately 800 paintings in its collection, and many of those works have ornate and delicate frames. The picture frame’s earliest origins can be traced back to Ancient Egyptian tomb portraits around the 2nd century A.D. Since then the humble picture frame has gone through many evolutions, being reworked to compliment different art movements. Around the 14th century most frames were created to display large church-commissioned paintings which were designed never to leave that setting. The 16th century Renaissance saw a rise in families with enough wealth to commission paintings for display in their own estates, thus the advent of the more portable frame. Unknown (after Raphael), Madonna Della Sedia, 18th-19th century, oil on canvas, collection of Sarjeant Gallery Te Whare o Rehua Whanganui. The painting (upper) and its 1380 x 1165mm frame are an exact replica of Rapheal’s Madonna of the Armchair 1514, which was faithfully recreated some time in the late 18th-early 19th century. Although not quite as old as the original, this frame is in a fragile state due to its size, weight, and method of production. 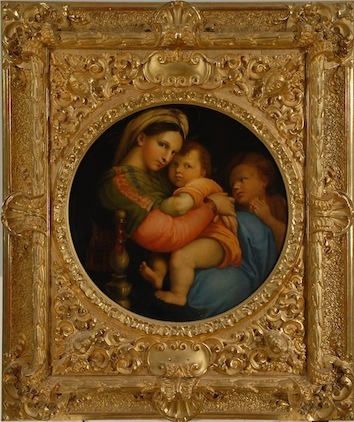 The frame has a solid wooden base, with elaborately molded plaster decoration on top of this, with a final layer of gilding replicating the cassetta frames popular at the time of the original painting. Attributed to Gaspard Dughet, Untitled (Fishing), circa 1635, oil on canvas, collection of Sarjeant Gallery Te Whare o Rehua Whanganui. The Dughet painting (lower) is one of the oldest works in the collection, and dates back to the 17th century. 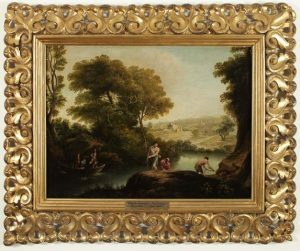 It’s 760 x 800mm Baroque-style frame features a repeating pattern of spiralling organic forms which were common in frames of this era to project and emphasise the painting’s subject matter, in this case a scene in nature. The frame is made from carved wood that has a layer of smooth plaster over the top, followed by gilding.